Külmletid liha, vorsti ja juustutoodete müügiks. Letil graniittasapind, jahutusega aluskapid, pleksiklaasist uksed taga, ventileeritud või sataatiline jahutus jahutus. Võimalik lisada erinevaid lisasid: rattad, vahejagajad, paberihoidjad jne. Working plate in 304 stainless steel. Display surface made of stainless steel AISI 304. Aluminium glass frame, flat glasses opening upwards, LED lighting only on the top. Control panel with digital thermostat and defrost at intervals, thermoformed side panels in ABS. 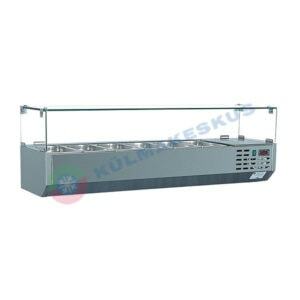 Plastic pan for the collection of defrost water to be emptied manually. Potentiometer for the fans. 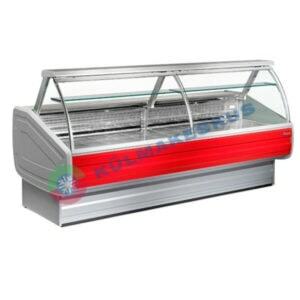 Equipped with plexiglass rear sliding doors and cataphoresis coated evaporator. 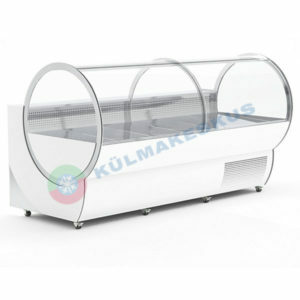 Chilled counter for the display and sale of delicatessen, sausages, cheese and meat. Built in plasticized sheet metal both inside and outside. Display surface in AISI 304 stainless steel, working surface in granit. Sides in ABS, insulation with polyurethane foam. Static or ventilated cooling. Cool-storage with doors. Built-in hermetic compressor unit. Automatic defrosting with timer. 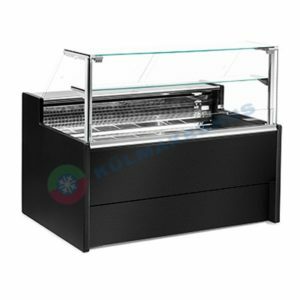 Refrigerated display-cabinet available in the following versions: static with refrigerated storage, static without storage, ventilated with refrigerated storage. 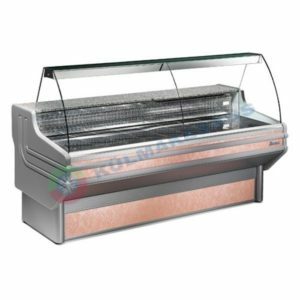 Made of plastic-coated steel sheet, the display surface is of stainless steel AISI 304, the insulation of expanded polyurethane, the side ends of thermoformed ABS and the working top of granit. The refrigerated storage is completed of doors and indipendent evaporator. The front decorations are as indicated on the colour chart.